Look up piscivore in Wiktionary, the free dictionary. A piscivore /ˈpɪsᵻvɔər/ is a carnivorous animal which eats primarily fish. 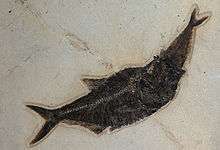 Piscivorous is equivalent to the Greek-derived word ichthyophagous. Fish were the diet of early tetrapods (amphibians); insectivory came next, then in time, reptiles added herbivory. Some animals, such as the sea lion and alligator, are not completely piscivorous, often preying on aquatic invertebrates or land animals in addition to fish, while others, such as the bulldog bat and gharial, are strictly dependent on fish for food. Humans can live on fish-based diets as can their carnivorous domesticated pets, such as dogs and cats. The name "piscivore" is derived from the Latin word for fish, piscis. Some creatures, including cnidarians, octopi, squid, spiders, sharks, cetaceans, grizzly bears, jaguars, wolves, snakes, turtles, and sea gulls, may have fish as significant if not dominant portions of their diets. Numerous extinct and prehistoric animals are either hypothesized to have been primarily piscivorous due to anatomy and or ecology, or have been confirmed to be piscivorous through fossil evidence. 1 2 Sereno, Paul C.; Beck, Allison L.; Dutheil, Didier B.; Gado, Boubacar; Larsson, Hans C. E.; Lyon, Gabrielle H.; Marcot, Jonathan D.; Rauhut, Oliver W. M.; Sadleir, Rudyard W.; Sidor, Christian A.; Varricchio, David D.; Wilson, Gregory P.; Wilson, Jeffrey A. (1998). "A long-snouted predatory dinosaur from africa and the evolution of spinosaurids". Science. 282 (5392): 1298–302. Bibcode:1998Sci...282.1298S. doi:10.1126/science.282.5392.1298. PMID 9812890. ↑ Dal Sasso, C.; Maganuco, S.; Cioffi, A. (26 May 2009). "A neurovascular cavity within the snout of the predatory dinosaur Spinosaurus". 1st International Congress on North African Vertebrate Palaeontology. Muséum national d'Histoire naturelle. Retrieved 22 September 2010. ↑ Devlin, Hannah (November 20, 2009). "Meet Boar, Rat and Pancake: the ancient, giant crocodiles found in Sahara". Times Online. ↑ Head, J.J; Bloch, J. I; Moreno-Bernal, J. (2013). "Cranial Osteology, Body Size, Systematics and Ecology of the giant Paleocene snake Titanoboa cerrejonensis". Vertebrate Paleontology: 140–141.